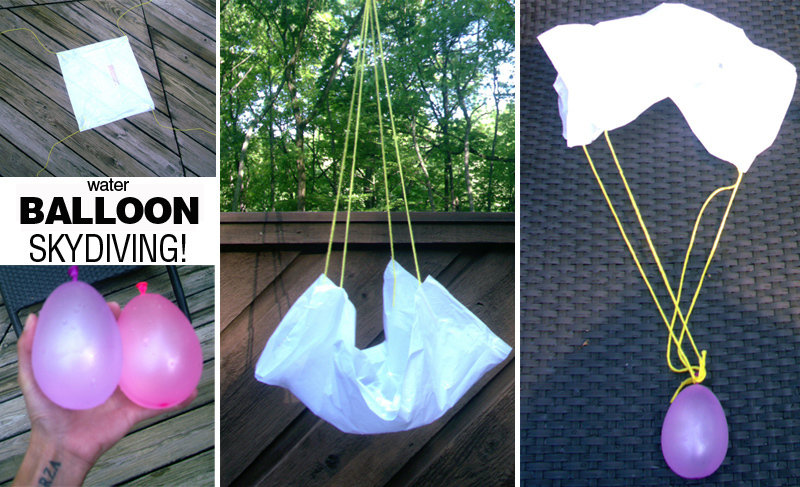 Have a blast experimenting with gravity and air resistance by having a water balloon throw down! 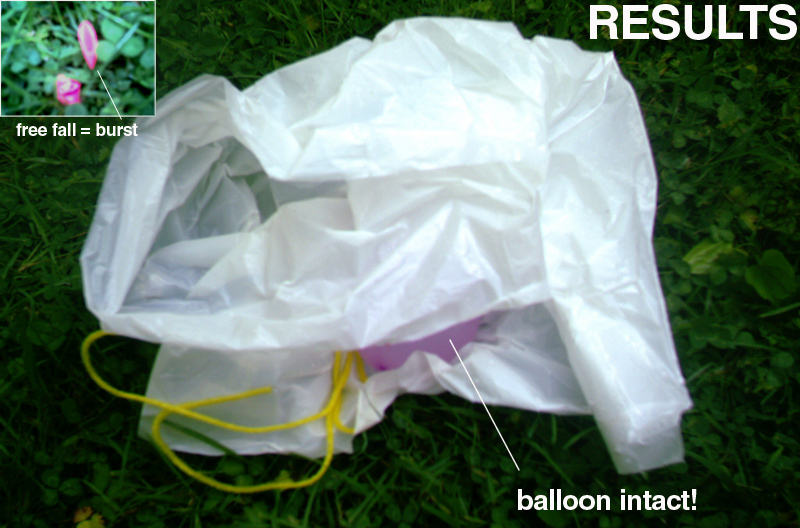 Grab 2 filled water balloons and 1 plastic grocery or garbage bag. I used a small trash bag, folded it over, and taped a piece of yarn on each corner. Once your parachute is ready, attach one of your balloons. Simply tie a knot around the knot of your filled balloon. Next, find a high place to drop your balloons. Before all the action begins, have kids make a prediction. Will both balloons burst when dropped? Can a parachute keep a water balloon intact? Which balloon will come out on top? Now, time for the free fall! Drop the balloon that has no protection. After the splat, try your parachute protected balloon. Below are the results, I tried to snap an action shot, but my reflexes were delayed! The parachute fills up with air when you drop it. The air slows down the balloon's landing, pushing away from the earth's gravitational pull, preserving your balloon! Free Fall - The balloon with no parachute falls at a much faster rate of speed, causing it to hit the ground harder, so it POPS! Have fun with a bouncy, wet yo-yo! Spring it back and forth, will it POP?! All you need is a super long rubber band and one water balloon. Fill your balloon. Then, cut your rubber band. Tie one end of the band around the knot of your balloon. On the other side of the band, make a loop and tie a knot. While playing with your yo-yo, talk about potential energy and kinetic. Throw a water balloon yo-yo competition with your friends! Who's yo-yo will last the longest before it bursts?! Click here for water balloon wet n wild math! Wow, that looks like a good time! We may have to try this one out. Even the 19 year old will want in, I'm pretty sure. I had a good time launching them!